Rwanda is one of the smallest countries in Africa and is most widely known as the location of a violent genocide in 1994 that killed as many as 20% of Rwanda’s total population. As a result of this event, Rwanda is a very young country with 43% of the population being under the age of 15. 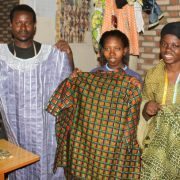 DMI has been working in Rwanda to train deaf young people to be evangelists and leaders in our churches. There are currently six churches that have been planted by DMI in Rwanda that are spread throughout the country.